Economies are constantly evolving. Industries which once employed thousands of people can later become uncompetitive and unprofitable. 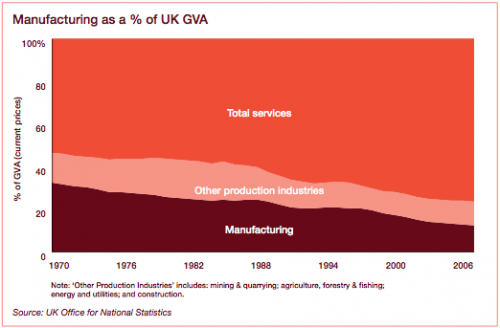 The UK has seen the rise and fall of many manufacturing industries. Industries such as cotton, wool, coal and ship-building were once key aspects of the UK economy, employing thousands of people in dense areas, but over time they lost their former dominance and now are just shadows of their former selves. 20 years ago, the record industry was very profitable, but in a short space of time, people stopped buying CDs and the record shop industry suffered dramatic fall. 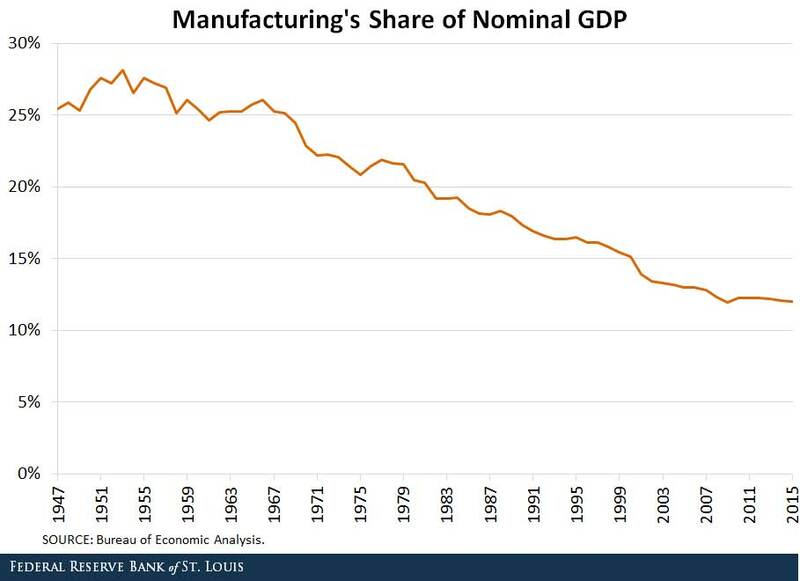 This industrial decline can enable the economy to progress and new innovation to come forward. But for those left behind – it can cause structural unemployment and stagnation. Should we worry about declining industries? There are different approaches. Free Market approach – Joseph Schumpeter in 1942 coined an influential term ‘Creative Destruction‘ – the idea that in a capitalist system there is an incessant process of innovation by which new production methods replace outdated ones. The fact old industries decline is good because it enables resources to move to more productive areas of the economy. In the long-term, it enables higher living standards and higher wages. Market failure – The other approach is to say declining industries can cause market failure – regional unemployment – structural unemployment, regional decline. Therefore, there is need to meet these short-term problems of structural change. The UK coal industry used to employ over a million men in 1920. Today, the coal industry employs only a few thousand. On the one hand, this has enabled employment to shift to more productive industries, but there have also been short-term and medium-term costs of high rates of unemployment in these former coal industries. Firms going out of business will lay off thousands of workers increasing unemployment. This unemployed resources will lead to lower GDP and a wastage of resources. Industries are often localised in particular regions. Therefore the unemployment is concentrated in certain areas, creating regions of low income, low employment. For example, during the process of de-industrialisation, we saw much higher unemployment rates in areas, such as South Yorkshire, Glasgow, South Wales. The perceived lack of opportunities can demotivate and discourage people, leading to social problems, such as crime and mental health problems. Hysteresis. In theory, the free market will create new jobs and industries, but often high unemployment and poorer prospects persist for many years, even decades, due to the difficulty of re-invigorating depressed areas. Negative regional multiplier effect. It is not just lost jobs in the former industries, but also related jobs in the service sector, which will be lost. When coal mines closed, many local businesses (shops, pubs e.t.c) suffered from the decline in custom. Inequality. Some will benefit from the evolving economy, but some of the former workers will be left behind. For example, manual workers who have worked for 30 years in a steel industry may find it quite difficult to get jobs in new industries like technology and the retail industry. Unbalanced economy. The UK’s de-industrialisation has been a factor in a persistent current account deficit. The decline in the manufacturing sector has a negative impact on exports. This decline in exports has not been compensated by growth in the retail and the service sector, which is less successful in exporting. Declining industries are an aspect of the free market. Unprofitability is a sign that resources should be moved to more profitable areas, where labour and resources can be used more efficiently. However, for a time period, there is likely to be market failure. High rates of unemployment in a particular region can make it difficult for the unemployed to find work. There will be many applicants for a small number of vacancies. The unemployed may have insufficient skills to move into other areas of the economy. A type of occupational immobility. There maybe geographical mobilities in preventing workers moving to areas of better employment prospects. There may also be geographical immobilities in encouraging new firms to move to depressed areas of high unemployment. It takes time for the economy to create new jobs and new employment, leading to prolonged periods of structural unemployment. A declining industry has a very visible impact on the local community. People can see very obviously the potential for unemployment and declining communities. It is much harder to see the new jobs and new firms, which will take time. Declining industries are an inevitable impact of economic growth and higher productivity. The UK has seen a fall in employment in manufacturing industries, but also a rise in productivity. Sometimes the declining industries have hard, dangerous jobs. For example, coal mining was dangerous and difficult. The UK has benefited from cheap prices of imported manufacturing goods because clothes are now cheaper to import. The UK cotton industry has declined as a result, but we do get cheaper clothes, which enables us to spend more on new retail and service sector industries. The UK has lost comparative advantage in many industries, but also gained new comparative advantages in financial sector. It is good that the UK economy hasn’t been stuck in producing exactly what it produced in the past. Moving resources out of unprofitable industries, has seen the growth of many smaller niche industries. How to deal with industrial decline? Government grants for retraining of unemployed workers. Government grants for firms to move into depressed areas. 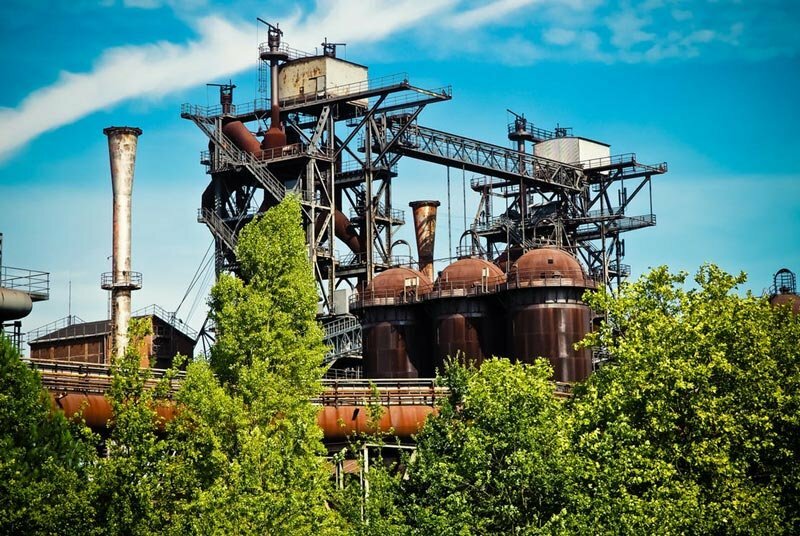 Industrial decline is an inevitable part of a modern economy. To hold back change – like the Luddites tried to do – would mean we could be stuck with manual weaving of the Nineteenth Century. 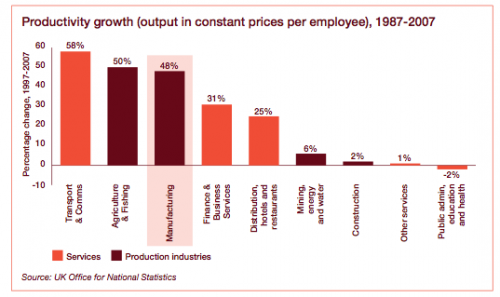 The mirror image of industrial decline is growth in other sectors of the economy. However, rapid change can cause local problems – it is not necessarily a Pareto improvement, therefore there is a case for government intervention to manage decline and limit the scale of temporary problems associated with regional change. ← What is needed for specialisation?